How many times have you walked through a store’s doors and—to your extreme embarrassment—set off the anti-theft alarm? It’s surprisingly easy to do, even when you’ve paid for your item and had it “deactivated” at the checkout. 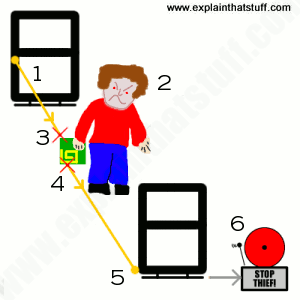 Anti-shoplifting alarms use a technology called RF (radio-frequency), while a similar (but more advanced) technology called RFID (radio-frequency identification) has many other uses, from tracking pets and public library stocktaking to collecting fares from bus passengers. Let’s take a closer look at this cunning technology and find out how it works! Radio or wireless is a way of transmitting energy through empty space—that is, instead of using a wire cable. The energy is carried by invisible waves of electricity and magnetism that vibrate through the air at the speed of light. The basic science and the practical technology of wireless communication was developed in the second half of the 19th century. During the early 20th century, “radio” came to mean audio programs beamed through the air from giant transmitters to cumbersome electronic boxes sitting in people’s homes. When inventors found a way of sending pictures, as well as audio, television was born. Today, all kinds of things work using the same wireless technology, from digital radio and television to cellphones (mobile phones), and wireless Internet. Radio and television involve sending radio waves in one direction only: from the transmitter at the radio or TV station to the receiver (the radio or TV set) in your home. Wireless Internet and cellphones are more sophisticated because they involve two-way communication. Your cellphone, for example, contains both a radio receiver (to pick up an incoming signal from the person you’re speaking to) and a radio transmitter (to send your voice back to the other person). Radar is another technology that uses radio waves. Planes and ships fitted with radar transmitters send out beams of radio waves and listen for echoes—reflected radio beams bouncing back off other planes and ships nearby. Anti-shoplifting devices are a little bit like radar: they beam radio waves out into a store in the hope of catching a stolen book or CD as it passes by. But how exactly do they work? Imagine your mission is to design an anti-shoplifting device using some old radio sets you found in the garage. You could build something a bit like a radar (with a combined radio transmitter and receiver), sit it by the shop doorway, and point it at people passing by. Radio waves would pass out from your transmitter, bounce off people walking past, and then reflect back to your radio receiver. The trouble is, this wouldn’t actually tell you anything useful, because everyone would reflect the radio waves in exactly the same way! You wouldn’t know whether people were shoplifting or not, because there would be no way to distinguish shoplifters from ordinary customers or people who hadn’t bought anything at all. What you’d really need would be for shoplifters to reflect radio waves in a different way to everyone else. But how? Anti-shoplifting devices have cracked this problem. As well as having a transmitter and receiver at the doorway, every item in the store contains a concealed RF “tag”. In bookstores and libraries, you’ll find very discreet “soft tags,” stuck to one of the inside pages. In record stores, the plastic shrink-wrap may have an RF tag stuck onto it, or CDs may be locked into large plastic cases with RF tags built into them, which can be removed only be a special tool at the checkout. In clothes stores, there is typically a “hard tag” (a chunky, round, white plastic tag) bolted onto each item with a sharp metal spike (sometimes the tag has ink inside it so it spills all over you and spoils the item you’re trying to steal if you attempt to remove it). Some of these tags are cleverly concealed so you can’t spot them. Others are deliberately very obvious and easy to see—so they deter you from stealing. The gates on the doorway (and the frequent alarms) are another very visible deterrent to shoplifters. If you walk through the doorway without paying for something, the radio waves from the transmitter (hidden in on one of the door gates) are picked up by the coiled metal antenna in the label. This generates a tiny electrical current that makes the label transmit a new radio signal of its own at a very specific frequency. The receiver (hidden in the other door gate) picks up the radio signal that the tag transmits and sounds the alarm. Why doesn’t the alarm sound when you pay for something? You may have noticed that the checkout assistant passes your item over or through a deactivating device (sometimes it’s incorporated into the ordinary barcode scanning mechanism, and sometimes it’s completely separate). This destroys or deactivates the electronic components in the RF label so they no longer pick up or transmit a signal when you walk through the gates—and the alarm does not sound. What’s the difference between RF and RFID tags? It’s all a bit more complex than I’ve made it sound so far because there are, in fact, two quite different types of RF tags and they work in a slightly different way. Often the term “RFID” is loosely used to describe both, but there’s a big difference between them: RF tags all send the same, simple signal and simply tell the receiver that something is present; RFID tags send more complex signals that uniquely identify whatever they’re attached to. 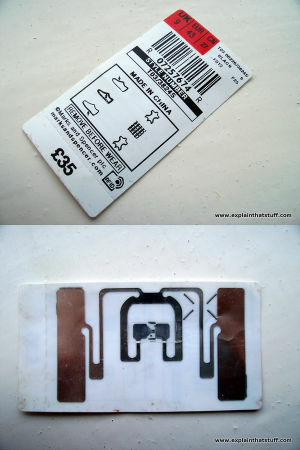 These are the simplest RF tags and they’re used mainly in what’s called electronic article surveillance (EAS)—the anti-shoplifting technique I’ve described above. All the tags are exactly the same and none of them identify the articles to which they’re attached. So in a store, RF tags set off the alarm when you try to steal something, but the alarm mechanism doesn’t know what you’re stealing, only that you’re stealing something: there’s no way of telling any one item from any another. One of the most popular RF technologies is called acousto-magnetic (AM). A pulsed beam of radio waves from the transmitter strikes the tag, making it give off a precise frequency radio signal. The receiver picks up the signal, verifies that it’s at the correct frequency, and then sets off the alarm. One big advantage of AM tags is that they can be scanned at quite a distance and at speed, making them popular in antitheft systems (which have only seconds to pick up a signal from someone walking or running through a shop doorway). These are more advanced and differ from simple RF tags in that they uniquely identify the article to which they’ve been attached: the radio signal that zaps from the article to the receiver contains a digitally encoded identifier. That’s how self-checkout machines in libraries work: they beam radio waves into the RFID tag in the back of the book, receive the radio signal back from the book, and decode this to figure out a digital code that uniquely identifies which book you want to check out. A computer attached to the scanner does the rest (so in a library, the self-checkout machine communicates with the library’s computer to update the main database whenever you check out or return a book). 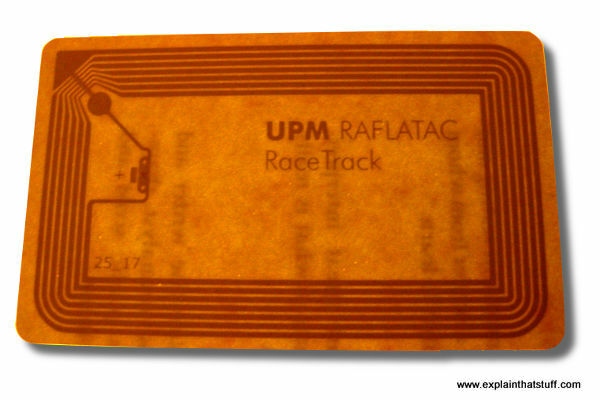 Unlike RF tags, RFID tags tend to work over much shorter distances. Some actually have to be held right next to a reader device, while others operate at a distance of 10cm (4 inches) or less. You can’t blame stores for wanting to install systems like this—especially when you hear that around 10 percent of all “shoppers” commit theft. But stopping shoplifters is only one of the things for which we can use RF technology—especially RFID technology, which is much more sophisticated. Some cities are already using active RFID tags embedded in car windshields to collect tolls automatically on bridges or highways as people drive by. This saves drivers having to slow down, stop, or fumble for the right change. Smartcards used on buses, subways (the underground or metro), and other forms of public transportation also contain RFID chips. As you touch your smart card on the reader, the card automatically debits your account with the cost of the journey. Smartcards fall into two categories known as contact and contactless according to whether you have to hold your card to the reader or a short distance away (and that depends on the type of RFID technology it’s using). While some contactless credit and debit cards use RFID, others use a rival technology called near-field communication (NFC), which is briefly explained in the box below. Libraries make extensive use of RF and RFID: RF tags to secure their stock and RFID tags to make it possible for people to use self-service checkout machines. When you check books in or out of a library using one of those machines, you’ve probably wondered how it knows which book you’re borrowing without you having to scan a barcode. The answer is that there is an RFID chip stuck inside the book’s cover. When you place your book on the glass plate, the machine reads the book’s details instantly and automatically by sending a radio signal to the chip. Since radio waves pass straight through cardboard and paper, you don’t even have to open up the book! 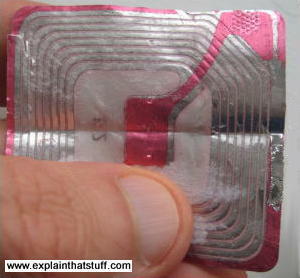 RFID tags are likely to become even more popular in the future. Soon, you might have an RFID chip embedded in your passport to speed your passage through ports and airports. An RFID chip implanted under your skin might save your life in an accident by transmitting your medical information to an emergency team. Doctors would simply wave a reader over your hand (or wherever the chip was implanted) to gain immediate access to your medical records. Systems like this obviously raise huge concerns about people’s privacy. Implanted identity chips would mark the arrival of the Big Brother state, capable of monitoring everything we do and everywhere we go. Although there might be enormous benefits, most people would need a great of persuading to accept such a drastic invasion of their privacy! Just when you’re getting used to one technology, something new comes along instead! RFID has been around for years and, as its name suggests, it’s generally been focused on identifying things (and people) using radio waves. But it was never really designed for the 21st-century world where people need to identify or connect to things in a very ad-hoc way, often by going online to authenticate data or make payments. And anyway, now most of us carry smartphones, why should we also need a bunch of RFID smartcards that we have to keep charging up with credit? Why not just carry one device that does everything using a set of secure apps and connects to the Internet whenever it needs to? For this, we have near-field communication (NFC), which allows smartphones (or other devices) with embedded chips to read, write, and connect to other nearby NFC devices (card readers on buses or access turnstiles at sports stadiums, for example). Using 13.56 megahertz-frequency radio waves over distances of 10cm (4in) or less, it’s a bit like a cross between RFID and Bluetooth “pairing” (the way two nearby Bluetooth devices connect together). So far, the best-known use of NFC is in contactless smartphone payment systems like Android Pay, but there are likely to be many more applications in future, from smart house keys (where you unlock your door with a phone app) and public transportation passes to electronic rock concert tickets and ATM cards. One of the advantages of NFC over RFID is that it can be used much more intelligently by automated devices like smartphones to do a whole range of different things more or less automatically. Sony, for example, has fitted NFC chips into many of its new products so they can talk to one another and swap data more easily. That makes it easier to upload photos from your digital camera to social media or to view photos from your camera on your TV. Just as NFC brings more convenience, so it brings extra problems of security and privacy. What if other people’s NFC devices start reading data from the smartphone in your pocket when you’re standing nearby? What about malware (viruses and other malignant code) passing into your smartphone from someone else’s? Ah well, it seems every new technology has to bring drawbacks as well as benefits!